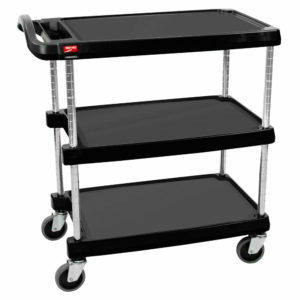 These polymer carts are very versatile and suitable for a wide variety of industries. The shelves are fabricated out of high-density, polyethylene, an extremely resilient polyolefin that provides excellent stain and chemical resistance and smooth surfaces allow them to be wiped clean easily. Cart shelves are offered with either a ½” (13mm) deep ships ledge or a deep 2 ¾” (70mm) ships ledge for product and spill containment. Standard cart offerings are in a 2-shelf or 3-shelf configuration, all of which include a set of stem-mounted swivel casters with donut bumpers and 4” (102mm) diameter non-marring wheels. Capacity is 150lbs (68kg) per shelf and 400 lbs. (182kg) per cart. Intermediate shelves can also be added if increase storage space is needed. 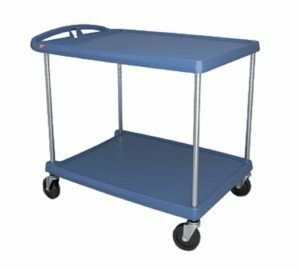 Carts are available in colors of blue, black, gray and slate blue with Microban®, which is an antimicrobial protection formula that inhibits the growth of bacteria, mold, mildew and fungus. Microban® is only available with slate blue carts.